Come with your own questions, stories, and wonderings, to listen and share with open minds and open hearts. No "right answer" provided... just good conversation, about things that matter, with good people, over a drink with Rev. Michelle. In the OBUC chapel, off the kitchen. Contemplative, candlelight chant, scripture, silence and prayer in the Oak Bay United sanctuary. A beautifully grounding and meditative experience. We gather year 'round! - on the 2nd and 4th Friday of each month for fellowship and fun, from 6-9pm and the occasional Saturday afternoon. On Sunday mornings during the school year, we gather in the Youth room at Oak Bay United. Come on Fridays, Sundays, or both; we'll be glad you came, and hope you are too! 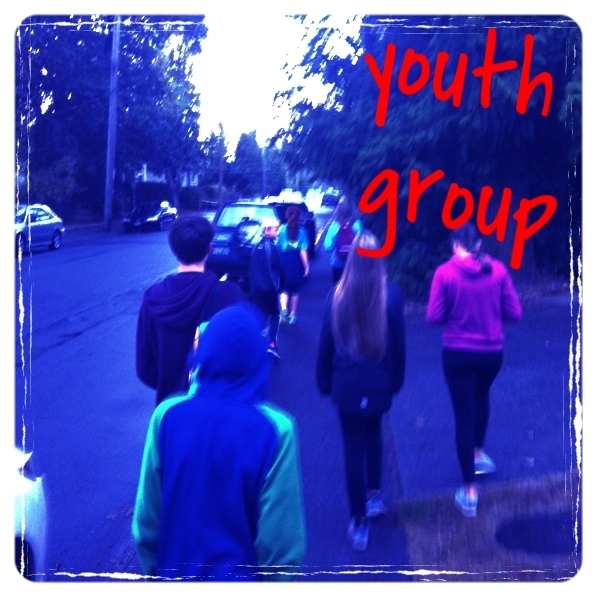 Click here for more information on Youth at Oak Bay United Church. Prayer Shawl Ministry is a tangible way of offering the support, love and comfort of Oak Bay United Church as a part of Pastoral Care. The shawls are knitted or crocheted at home with prayers and concern for those who may receive them. The shawls are brought to the office, blessed in worship and distributed at the discretion of Rev. Michelle. Healing Pathway is an accessible way to develop skills for offering healing to yourself and to others. The training uses a meditative, energy-based experiential approach. A United Church ministry, Healing Pathway was developed from the American Holistic Nurses Association’s Healing Touch. The Healing Pathway practice groups meets once per month. If you are curious about or interested in this ministry, please talk to Rev. Michelle. All men are invited for regular evenings of interesting conversation, good food, and fellowship. Gathers the third Monday of the month, at 6:30 pm, $10 donations for dinner. Sign up in the Church office. The Prayer Chain is a ministry available to anyone who would like to request others to pray for them. The mechanism is simple; just call the person listed in the weekly Worship Sheet and request that the Prayer chain group include you in their prayers. Requests for prayers may be made on behalf of a third person, but only with their permission. Confidentiality is held in sacred trust. You provide the person in the bulletin with basic information. No need for any detail. That person insures others in the prayer chain receive the information. You will remain on the prayer chain for one week. Please call again if you want to remain on the chain. If you would like to become part of this ministry, contact Rev. Michelle. Oak Bay United has a very special friendship with the children at Slangspruit Primary School (SPS, in Pietermaritzburg, South Africa), a rural school in an impoverished community in South Africa. Many children here eat only one meal a day, a meal in school that is provided by the government, but unfortunately lacks nutrition for growth and physical and mental development. In partnership with Ukulapha Outreach Project, funds are sent to Carolyn Burns (founder and director), who lives in South Africa, to purchase nutritious food and ingredients and supervise the preparation of the food, that is served to the over 1,000 students at SPS. The food is cooked in huge vats in the school kitchen. Four special nutritious meals a year are provided: Easter Meal, Celebration Meal, Ubungane (Friendship) Meal and Christmas meal. For one meal in 2014, a Oak Bay United youth visited SPS to help Carolyn purchase the food to be cooked, spend time with the children in class, help prepare and cook the food, and serve the meal. “THE WAY OF LOVE” BIBLE STUDY: Join Rev Michelle in reading, praying and discussing the scripture readings for the coming Sunday. Every Wednesday afternoon from 1:00 pm-2:30pm.